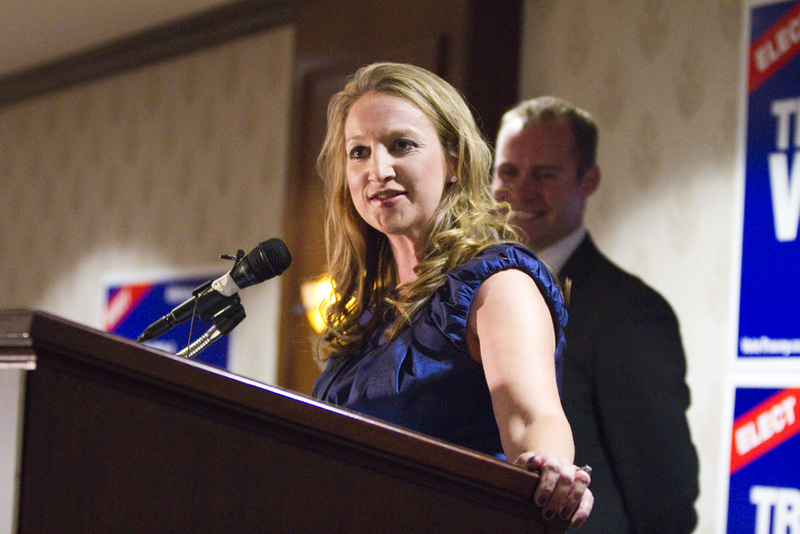 Tracey Weiler addresses her supporters after settling for second in the K-W byelection. (Photo by Kate Turner). For the first time in over two decades, Kitchener-Waterloo was something other than PC blue on election night. After a hard campaign and a gripping number of votes, Progressive Conservative Tracey Weiler lost the K-W byelection to NDP representative Catherine Fife Thursday night. Awaiting the results at the Waterloo Hotel, PC supporters watched the polls declare Fife in first place for most of the night, with Weiler following in second. According to unofficial final totals, there was an approximate 3,700-differencebetween Fife and Weiler. “It’s a little disappointing because you hope that it will be a good turnout, but it is what it is,” said Christine Elliot, the PC MPP for Whitby. Witmer was the riding’s MPP for 22 years until she stepped down in late April to take on an appointed position as chair of the Workplace Safety and Insurance Board. When Weiler arrived at the Waterloo Inn shortly after her loss was publicized, she was quick to exhibit her thanks towards her cheering supporters as well as reaffirming her faith in PC leader, Tim Hudak, who has come under heavy fire since losing last October’s provincial election. After describing her personal loss as “disappointing” after the hard work she and her team attributed, Weiler also described the party’s overall loss as “bittersweet”, as the NDP win meant that the Liberals did not achieve a majority government. “I’m very glad to see that the Liberal party was not afforded the majority government that they had been searching for,” Weiler stated. Although she is happy that the Liberal party was not granted a majority government, Weiler is also happy for Fife and her success during this byelection. “I’ve extended my congratulations to Catherine Fife and her victory for running such a great strong campaign,” said Weiler. Weiler holds firm that she would not have run her campaign any other way, citing the fervor and the intelligence of her campaign team as the catalyst of the party’s success. The compassion of both her team, as well as the voters, has Weiler already thinking about her future in politics. Look for more coverage from Thursday’s byelection in Wednesday’s issue of The Cord.